♫ A useful one page listening response resource for young students. ♫ Students are to select the word or words from the box, that best describe how listening to a piece of music made them feel. 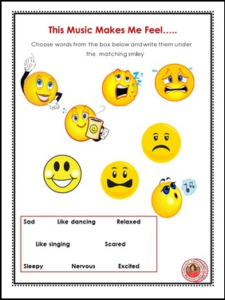 ♫ Students are to then write the word or words under the matching smiley face! • Look for the green star next to my store logo and click it to become a follower. That’s all you need to do! You will now receive email updates from theMusicTeacherResources store.